Becrux is nothing if not a world traveler. Born and raised in Italy, he literally and figuratively hit the ground running, winning his first four outings in his homeland to earn top honors as Italy's Champion Two-Year-Old of 2004. He then went to Dubai and won, then to America and won, onto Canada – and won, and then for good measure, he came back to America and won some more. 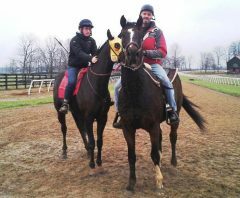 But Becrux is so much more than just a worldly racehorse. He was a stocky, gritty runner who gave Team Valor investors thrills again and again. That's why when the horse's form began to wane, managing partner Barry Irwin dug into his own pockets to purchase the horse outright and retire him to a slower pace of life. The plan was to purchase Becrux and send him to South African trainer Mike de Kock. De Kock ran the horse that year in Dubai, where he ran poorly in a pair of group stakes but won a conditions race by daylight and then some. So, with that, Becrux was imported to the United States at the conclusion of the Nad Al Sheba meet and placed with trainer Neil Drysdale. The colt was muscular and Irwin noted that he was getting quite thick in the neck, much like a stallion. Becrux ran for Team Valor and partner Gary Barber year after year, racking up wins and placings all over the country. Toward the end of his seven-year-old year, the gelding started showing signs of his age and was struggling to remain competitive with his peers. So, at age eight, Becrux retired from the racetrack and was given some down time at Margaux Farm. After a few months of enjoying the retired life, Becrux began subtly, and then less subtly, letting everyone around him know he was growing bored with paddock life, so Irwin suggested looking into making him a stable pony. Irwin asked around about making him into a stable pony and eventually found a gentleman who repurposed retired racehorses into track ponies. Streaker said he needed about four months to retrain Becrux. At the conclusion of four months, he told Irwin the horse needed more time. Once Becrux was ready, though, was he ever! He was sent to Fair Hill, the home base for many of Team Valor's horses and learned the ways of the racetrack in the picturesque Maryland setting. 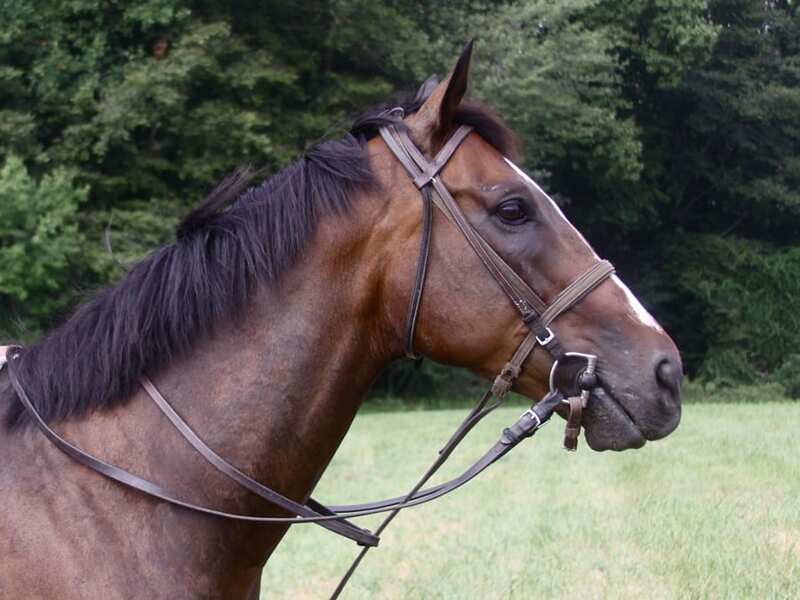 Becrux remained at Fair Hill for several years, enjoying his job and doing it well. This year, at now nearly 13 years old, Becrux has been transferred to Margaux Farm in Midway, Ky., where the work would be a step less demanding. At Margaux, Becrux shares a paddock with four other geldings and stays out about 15 hours a day. He comes in each morning to eat, get fed, and get to work, going out with three or four sets of horses each day. 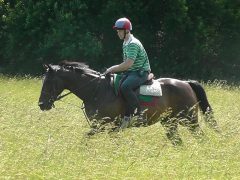 Still owned by Team Valor, the plan for Becrux is to remain at Margaux and work as a track pony for as long as he seems to enjoy the job. When the time comes to retire him, Irwin says he'll remain at the farm and hopefully enjoy a long, happy retirement. Race Earnings: $1,170,121 (Won – Woodbine Mile (G1), Wickerr H. (twice), Oceanside S. Premio del Dado (in Milan); 2nd – Play the King S. (G2), Del Mar Mile H. (G2), Wickerr S.; 3rd – Citation H. (G1), Morvich H. (G3), Sir Beaufort S., Bien Bien S.
If you have or know of a retired Thoroughbred with an interesting story to tell, we'd love to hear about it! Just email Jen Roytz ([email protected]) with the horse's Jockey Club name, background story, and a few photos. Jen Roytz was the marketing and communications director at Three Chimneys Farm in Midway, Kentucky. She is a freelance writer and marketing and public relations consultant for various entities, both equine and non-equine. She can also still be found on the back of an OTTB most days. Contact Jen on Facebook and Twitter. This entry was posted in OTTB Showcase Archive and tagged barry irwin, Becrux, Cosequin presents OTTB Showcase, Horse Racing, Jen Roytz, Mike de Kock, neil drysdale, Off Track Thoroughbreds, team valor, thoroughbred, Thoroughbred aftercare, thoroughbred racing, thoroughbred retirement by Jen Roytz. Bookmark the permalink.